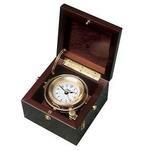 The forged brass case is polished and lacquered to resist furnishing. The screw bezel allows easy access to the components for adjustment. Provided with complete instructions, mounting hardware and a fresh battery. It carries a limited lifetime warranty. 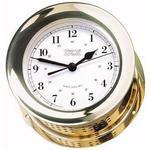 The popular Orion Collection of clocks and barometers are smaller versions of the Weems & Plath Atlantis Collection. 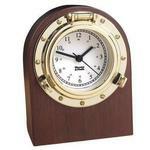 Screw bezel adds classic nautical look and allows easy access to components for adjustment. The solid cast brass case is hand polished to a dazzling shine and lacquered to resist tarnishing. Hand assembled in Annapolis, MD USA. 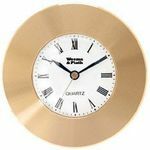 There is a limited lifetime warranty included with a purchase of the Orion Quartz Clock.